I'm probably one of the last people on earth that didn't have a microwave in my apt. 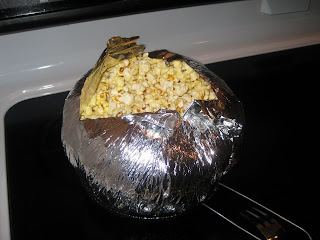 My boyfriend managed to find this old school stovetop popcorn for me in a random walmart in the South and it was hilarious to watch this thing pop. In addition to sounding like a bunch of gunshots were being fired, it took a lot of energy constantly shaking the bag so it didn't burn. 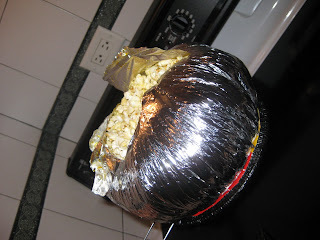 All in all, the popcorn popped rather quickly, but I think I prefer using a microwave.